East Hampton Public Library CT: Consumer Reports : Using researchIT CT for Results! Welcome to East Hampton Connecticut and to the East Hampton Public Library's weblog! Stop by anytime to learn about new services and programs or simply to take a look at what's new in the world of East Hampton readers, viewers, and listeners. We offer public service posts when we can and welcome your comments and suggestions. Consumer Reports : Using researchIT CT for Results! The East Hampton Public Library is a former subscriber to Consumer Reports. The library dropped its subscription when the Connecticut State Library added it to its list of statewide researchIT CT services (formerly iCONN); i.e., no sense incurring a duplicate expense. Click and you will be asked to enter your library barcode number. Your card number is 14 digits long and should be entered without spaces between the digits. After entering your card number, click the login button. Once you are logged in, you'll see a list of databases from which you may choose. 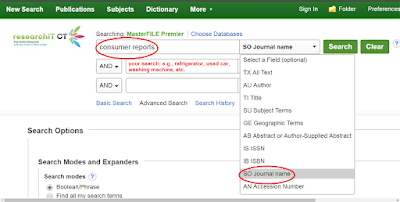 Scroll down through the list of available databases and check the box for MasterFILE Premiere. Press the enter key and you're ready to search and find information from Consumer Reports. 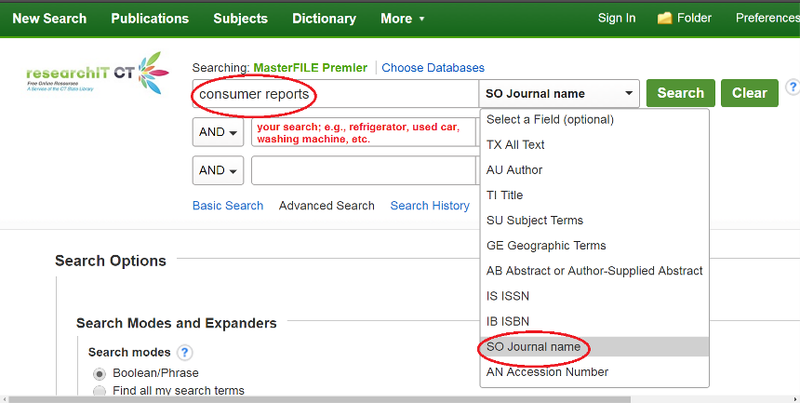 Use the 'Journal name' selection in the drop-down menu and enter (not case sensitive) consumer reports in the uppermost search box. In the second-level box, after the AND, enter the general product you are shopping for and for which you are seeking product reviews. The library is a department of East Hampton Town government. Our mission is to promote equal access to information and ideas, love of reading, and a wide range of community-based educational and cultural programs. Debate the prices but either way, the library's a good deal! Online Service Links to Go! Award winning books, bestsellers and a variety of newsletters with more reading suggestions. Newsletters are updated on the 15th of each month. ePrep courses feature expert video instruction, available anytime and anywhere, day or night, at home or on the road. What's more, ePrep Analytics monitors student progress throughout the course and recommends subject-matter and strategy lessons for review. Did we mention the service is free? All you need is your East Hampton Public Library card! If you are job searching, re-careering, or looking for expert advice on how to keep your resume up-to-date and compelling, use your East Hampton library card to access JobNow! ChiltonLibrary.com represents the most authoritative automotive repair information available to car owners. There are thousands of year, make and model combinations covering the most popular vehicles of the past 30 years, plus additional coverage of specialty models. If you're handy, ChiltonLibrary.com may also give you the how-to confidence to service or repair your vehicle. Click on the image and enter your East Hampton Public Library barcode number to login and match your vehicle to Chilton's Library info. Cool doings... Track the energy savings impact of the solar panel array at the Library/Senior Center!